Some people underestimate the importance of how a good shirt can make someone look and feel. It is not just another piece of clothing lying under a tailor-made jacket. A tailored shirt can set the tone for the rest of the outfit. It is surprising how much of a difference it can make to a man when he pairs it with a tie or trousers. The good thing about a tailored shirt is that it actually provides the comfort and durability that many are looking for. They last long and are a good investment. A custom-made shirt in Singapore, never goes out of style and is the best fit every time you choose to make or wear one. At Made Suits Singapore, we make sure the best fit happens. We curate and fine-tune each shirt to match it with your preferred sense of style and personality. It curates the best-tailored shirts in Singapore. This is the time to create a masterpiece of your own that last. Bespoke style is the best way especially when there is a plan to get things made specifically for yourself. In fact, it is the only way to getting your fashion sense close to perfect for any event. Here is how you can find and exclusively make the perfect tailored shirt in Singapore. Our Client Wearing our Signature Piece One Piece Collar. Birthdays, business meetings, dates. These are all just some of the few special events where you can make a good first impression. What better way to pull it off with a customised Made shirt? It is one of the bespoke places for men to get the best tailored-shirts in Singapore. First and foremost, choosing the right fabric is really important for sourcing a preferred style. Depending on the event that you are attending, Made Suits can let you choose a textile fabric from a wide range of materials. We work with 100% Japanese quality cotton, silk, wool, artificial fibres and blended natural fibres. Research has shown that Japanese quality cotton improves the breathability, durability and strength of the clothing. We strive for the utmost perfection by selecting the exact colours, patterns and construction according to your preference. All of the above combined can give you the right fit ultimately. 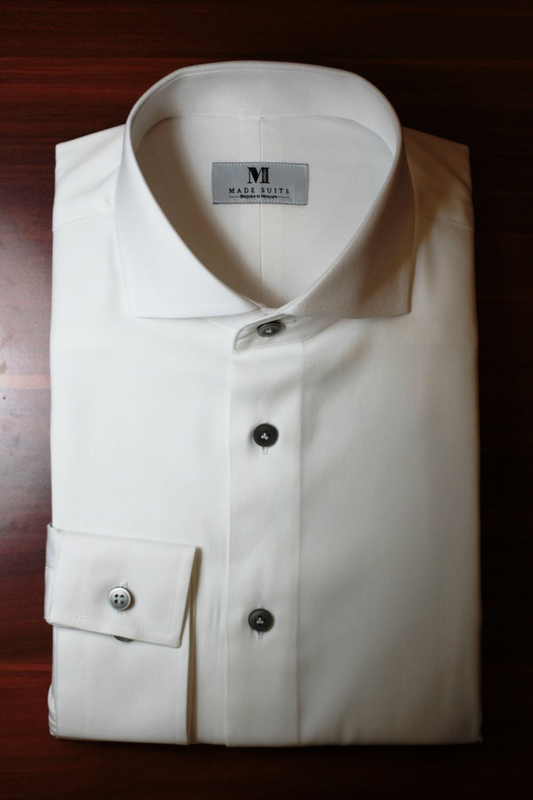 Making a tailored shirt in Singapore at Made Suits will meet all of your bespoke expectations. Our Selection of Collars for each and every face What can you go wrong? | Perhaps a wrong decision but our #made specialist is here to make you a wise decision. Finding the perfect collar which works with the shape of your face can be easy, especially with the help of our tailor specialists. The more celebrated collar styles are the classic collar, forward-point collar, spread collar and the button-down collar. An Example of Stiff Collar Fusing Standing high in your suit jacket. The Stiff Collar Fusing is great to complement collars with the ability to stand up strong under a jacket. 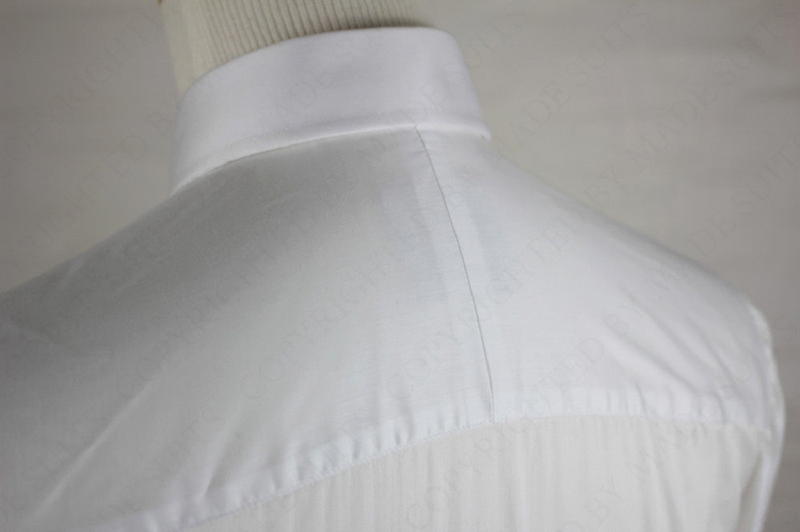 This is better than an ordinary collar which is prone to sliding down or being slanted instead of standing straight up. Do expect to attain such fine and precise work from the producers of the best tailored-shirts in Singapore. A COLLAR FROM A LEGEND. One Piece Collar from a Legend. The One Piece Collar, also known as the California Collar became popular in the 40s or 50s when Hollywood celebrity Gary Cooper wore it. This is an exclusively bespoke and custom item as it needs to be precisely cut with an exact curvature distinguishing it from other ordinary collars. The One Piece Collar is perfect for a casual night out as you can wear it on its own, with or without a blazer. 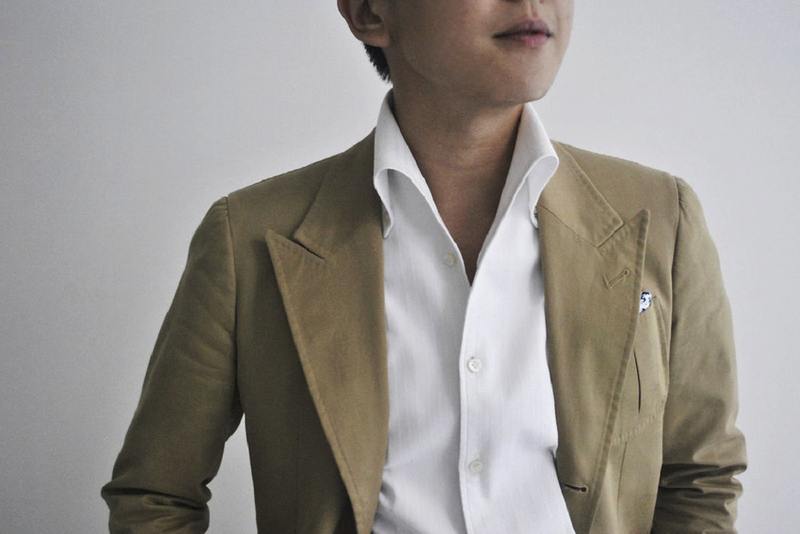 The best thing about the One Piece Collar is that it does not collapse when being worn with a blazer. 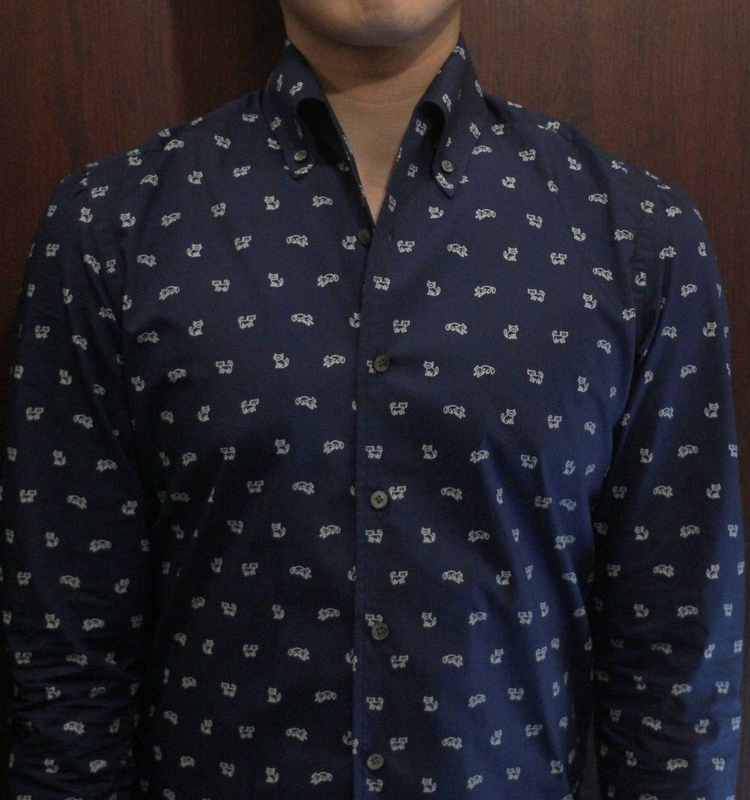 A good One Piece Collared shirt is not easily available everywhere in Singapore. Over here, we customise it for you to ensure the perfect cut. Made Suits ensure that shirts are made to the finest comfort level especially when you go about your day to day activities. Whenever there is pressure on the yoke behind the back of a shirt, it stretches. We use the “Split Yoke” to better cater to a wider range of movements and provide the wearer with more comfort. Unlike its retail counterparts, bespoke shirts have the luxury of using more fabric in the middle of the shirt, by simply rotating it at a specific angle just so that more stretch is added to it. A one piece yoke is only made from a single piece of fabric. If you are torn between a one piece yoke and a split yoke, the latter will be a better choice! A BUTTON FOR A LUXURY SHIRT. Our Australian Mother of Pearl Buttons. standard buttons are great. Made from a high quality plastic resin, these are incredibly resistant to cracking. The material is a whiter color than the golden hue of a mother of pearl button. While these plastic resin buttons will not crack, over a long time (+30 washes) the plastic can become degraded by the combination of intense chemical cleaners and high-heat dryers. 7/16″ in diameter. At Made Suits We use Australian Mother of Pearl buttons are a beautiful finishing touch for a high quality custom shirt. Measuring at 3.7mm tall, these thick buttons are not quite as thick as our Tall Mother of Pearl option, but definitely thicker than the standard MOP. They have a slightly more mottled, iridescent shine than our other Mother of Pearl offerings and have a slightly smaller diameter for a more sartorial look. 3/8″ in diameter. MADE SHIRTS BUTTONS VARETY OF DIFFERENT COLOURS TO CHOOSE FROM.